VELCRO® Brand construction fastening systems provide a greener option for manufacturers, architects, and builders—and can help earn potential LEED green building rating points. Our fastening solutions reduce the use of volatile organic compounds (VOCs), eliminate adhesive off-gassing, and reduce job site waste. VELCRO® Brand construction fastening systems require fewer tools; are easy to replace and reposition; prevent damage to the underlying building envelope; and can be applied in a wider range of temperature and weather conditions for improved productivity and reduced labor costs. 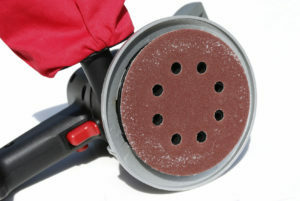 VELCRO® Brand hook and loop products are widely used in the abrasives industry. Our cost effective, lightweight knits and nonwoven loops are used as the backing for sanding medium. Our plastic hooks are used in the manufacturing of sanding equipment. This hook and loop combination provides a high performance, low cost fastening solution. VELCRO® Brand products are used to mount flexible solar panels to buildings with flat membrane roofs. The system can be rapidly installed, without penetrating the roofing system, is easy to maintain, and is removable. The largest system of its kind in the world was completed at a General Motors facility in Zaragoza, Spain, utilizing 85,000 solar panels and over 250 miles of our hook and loop fastening system. VELCRO® Brand fastening systems provide a cost effective, labor saving, and reliable method to install synthetic turf for athletic fields at professional and collegiate facilities.